The Queensland State Committee of the Crawford Fund has selected the recipients of the Honours Research Scholarships and Postgraduate Student Awards, which were open in February of this year. The purpose of the awards is to facilitate active student participation in international agricultural research projects, in order to help them gain valuable experience and expertise. The award recipients are also entitled to attend the 2016 Annual Conference and Scholars day, held in Canberra in August. We are pleased to announce the Queensland scholar awardees: Tarni Cooper, Aloesi Dakuidreketi, Chloe Jessica English and Tansyn Noble. Details of the scholars’ proposed projects are outlined below. Antimicrobial resistance (AMR) poses a global threat to livestock and humans; many important human antimicrobials are also used in agriculture, which has been attributed with accelerating AMR. 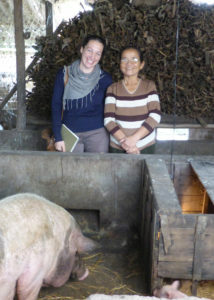 Control of antimicrobial use is proving to be a challenge in resource-poor, smallholder settings. This project will take a communication-for-social-change approach. To identify needs and opportunities for reducing inappropriate antimicrobial use in agriculture, the project will talk with a wide-range of stakeholders. Emphasis will be on the experience of farmers, livestock traders, feed and medicine suppliers, veterinarians, government extension-officers, policy-makers and public health officers, but others identified through the process will also be approached. The potential benefits of growing tomatoes in Fiji are substantial—this labour intensive industry can create jobs, improve the population’s nutrient intake, reduce imports and increase the income of growers. Tomato imports, however, still remain high as smallholder farmers are unable to meet the quality standards and services required by the tourism industry or the increasing urban local market demand. New systems that reliably produce high quality tomato seedlings are needed to be able to grow the high quality tomatoes required. Amending soils with biochar has the potential to provide benefits including improved soil fertility and induced systemic plant resistance. The use of biochar to induce resistance is a relatively untested concept. This research will evaluate biochar-amended potting media and soil for tomato production and its ability to induce resistance against early blight in Fiji. Several different amoeba have been identified in amoebic gill disease (AGD) of Atlantic salmon in Ireland and Australia. To date, molecular tools for identification are only available for one of these amoebe: Neoparamoeba perurans, which is currently considered the only agent causing AGD. The presence of the accompanying amoeba is based on morphological observations which are often discounted as unreliable. There is a need to identify other amoebae associated with AGD and to develop the appropriate molecular tools to undertake comprehensive diagnosis both within the laboratory and in the field. This research will develop the molecular tools needed to help decipher whether AGD is caused by a mix of amoebe and it will provide insight into amoeba ecology. Disease causes an estimated annual loss of US $18B to the prawn farming industry globally (FAO). Disease risks are managed predominantly through breeding practices that incorporate specific pathogen free (SPF) and/or specific pathogen resistant (SPR) genetic lines. With support from CSIRO, Viet-Uc run a world class prawn breeding program that incorporates an SPF approach to disease mitigation as well as selection for commercially important traits. This project will investigate disease mitigation through selective breeding for resistance to an Australian endemic prawn virus (GAV). It will establish industrial-scale protocols to test large numbers of prawns for their resistance to GAV and determine the genetic basis for this. The data collected will also feed into the larger selective breeding program.